"In the olden times they always gave the best place at the fire to the storyteller..."
Inviting Frau Wolle is easy- simply call and arrange an evening. from other countries: 0043-512-37 03 16 (this is a landline). You can also email me, but since I get very many emails and travel often it might then take me some time before I get around to answering. Every storyteller has things she or he does more often than others. While I am open to new events and also tell often at christmas celebrations, conferences, many kinds of celebrations and exhibitions my three areas of greatest experience are the following: Festivals, birthdays and libraries. My interest for and love of languages and my somewhat cosmopolitan approach to different countries might stem from my belgian father. I am a curious traveler, very interested in listening to others and at festivals I keep my timeframe. Here is a list of festivals where I have told stories. Some of these events only took place once, at others I performed in several years. At birthdays of people with different language backgrounds the story-time (also possible in two langauges) can be a uniting experience. Every story is a present for each one of the listeners. I have been a bookworm since I was 6 and could only satisfy my hunger for reading material thanks to libraries. I published seven books and studied "comparative literature“. I feel at home in a library, I greatly appreciate what these places provide for communities. 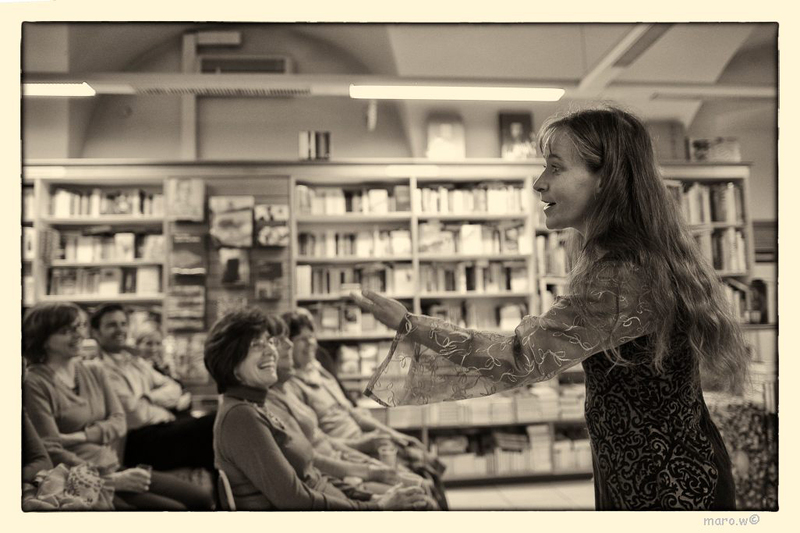 Therefor I tell with pleasure and often stories in (or for) libraries – in small villages as well as big cities. - An evening with music does not cost twice as much. Frau Wolle travels almost always from Innsbruck by train. For the sake of the environment the storyteller flies exclusively when it is cheaper and it is desired. For questions and exact information I can be reached at the following number. If I am currently traveling at the time you call, that will be mentioned on my answering machine message. For a response to emails I sometimes take a little longer to respond.